A structurally highly simplified, globally integrated coupled climate-economic costs model SIAM (Structural Integrated Assessment Model) is used to compute optimal paths of global CO2 emissions that minimize the net sum of climate damage and mitigation costs. The model is used to study the sensitivity of the computed optimal emission paths with respect to various critical input assumptions. The climate module is represented by a linearized impulse-response model calibrated against a coupled ocean-atmosphere general circulation climate model and a three-dimensional global carbon-cycle model. The cost terms are represented by strongly simplified expressions designed for maximal transparency with respect to sensitive input assumptions. These include the discount rates for mitigation and damage costs, the inertia of the socio-economic system, and the dependence of climate damages on the change in temperature and the rate of change of temperature. Different assumptions regarding these parameters are believed to be the cause of the marked divergences of existing cost-benefit analyses based on more sophisticated economic models. The long memory of the climate system implies that very long time horizons of several hundred years need to be considered to optimize CO2 emissions on time scales relevant for a policy of sustainable development. Cost-benefit analyses over shorter time scales of a century or two can lead to dangerous underestimates of the long term climatic impact of increasing greenhouse-gas emissions. To avert a major long term global warming, CO2 emissions need to be reduced ultimately to very low levels. However, the draw-down can be realized as a gradual transition process over many decades and even centuries. This should nevertheless not be interpreted as providing a time cushion for inaction: the transition becomes more costly the longer the necessary mitigation policies are delayed. However, the long time horizon provides adequate flexibility for later adjustments. Short term energy conservation alone is insufficient and can be viewed only as a useful measure in support of the necessary long term transition to carbon-free energy technologies. For standard climate damage cost expressions, optimal emission paths limiting long term global warming to acceptable sustainable development levels are recovered only if climate damage costs are not significantly discounted. Discounting of climate damages at normal economic rates yields emission paths that are only weakly reduced relative to business as usual scenarios, resulting in high global warming levels that are incompatible with the generally accepted requirements of sustainable development. The solutions are nevertheless logically consistent with the underlying discounting assumption, namely that the occurrence of global warming damages in the distant future as a result of present human activities is of negligible concern today. It follows that a commitment to long term sustainable development, if it in fact exists, should be expressed by an intertemporal relation for the value of the earth's future climate which does not degrade significantly over the time horizon relevant for climate change. Since the future climate is a common assett whose value cannot be determined on the market, the appropriate discount rate for future climate damages should be determined by an assessment of the public willingness to pay today for the mitigation of future climate change. 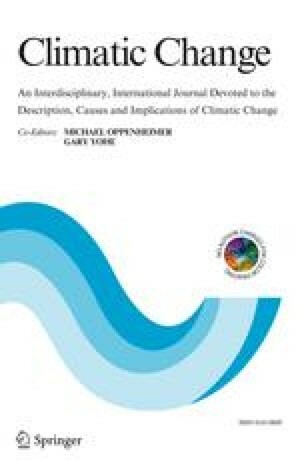 To translate our general conclusions into quantitative cost estimates required by decision makers, the present exploratory study needs to be extended using more detailed disaggregated climate damage and mitigation cost estimates and more realistic socio-economic models, including multi-actor interactions, inherent variability, the role of uncertainty and adaptive control strategies.